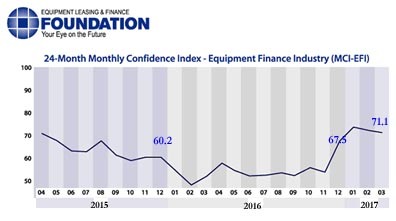 The Equipment Leasing & Finance Foundation released the March 2017 Monthly Confidence Index for the Equipment Finance Industry (MCI-EFI) this week. Designed to collect leadership data, the index reports a qualitative assessment of both the prevailing business conditions and expectations for the future as reported by key executives from the $1 trillion equipment finance sector. Overall, confidence in the equipment finance market is 71.1, easing from the February index of 72.2 but remaining among the highest levels of the last two years.